This is my opinion on the product. I received not compensation for my review of this item. Hi all!!! I have been busy & sick the last couple of days. I was going to post this yesterday but I decided to be somewhat productive & try to study. 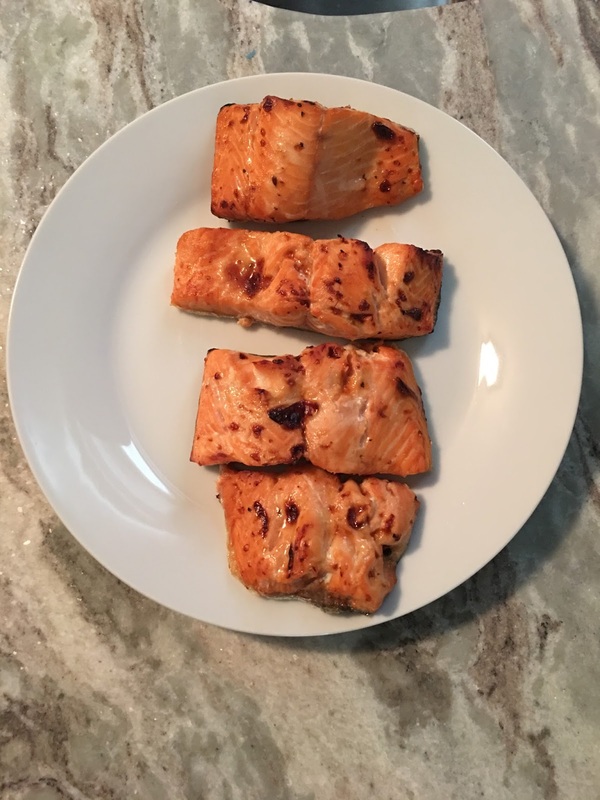 A few months ago, I bought an air fryer from QVC. My friend bought one at the beginning of the year & we used the a couple of days after she got it delivered. To say that I have been obsessed with it is an understatement. Since we have moved into the house, I not only have a place to put it but I have been using it on the regular. They have a variety of sizes on the site. The one that I purchased was the 3 quart since the 5.3 quart was sold out when I bought mine (my friend has that one). It comes in 7 colors (which in the 3 quart they only have the white one left). I chose the Turquoise because I like fun colors. The fryer is pretty easy to work. There are buttons for fish, poultry, beef, & potatoes. When you turn it on, it does go to a preset temperature of 370 degrees with the time depending on if you use one of the preset button or fixed the time yourself. It can be adjusted to below 370 degrees in increments of 10 degrees. The highest that the fryer will go is 400 degrees. My fryer came with the fry basket & a the pie try. Since my friend bought the larger one, that one came with a divider for when you want to cook two items at once such as an entree & a side. This is the air fryer basket. For those who are not sure how this work: The holes in the basket cooks the item placed in it by use the air to crisp/fry the item without grease. 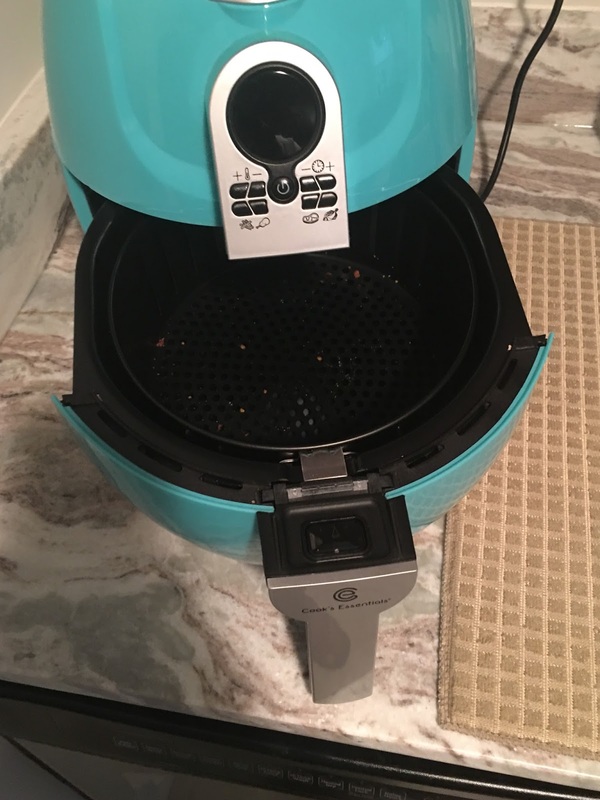 You have to push the power button twice in order to make the fryer to start cooking. To say that I love this fryer is an understatement. 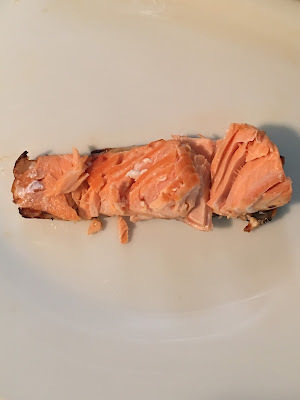 The other night, I bought some salmon at Whole Foods & decided to try it out. 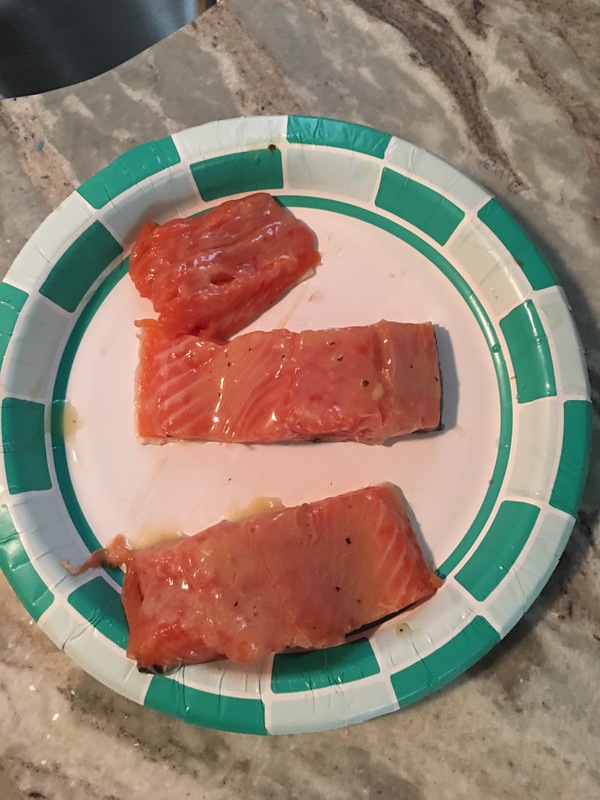 I brushed a little Lemon Pepper marinated on each piece. The Air Fryer was set at 370 degrees for 8 minutes. One thing that is important is to use oven mitts when opening the fryer. I use tongs usually to take whatever I cooked in it out. To me, the fish turned out pretty good. It was flaky, not over or undercooked. I did put a little too much sauce on it (which are the brown pieces on the fish). It did not have a fish small once cooked & was easy to remove. 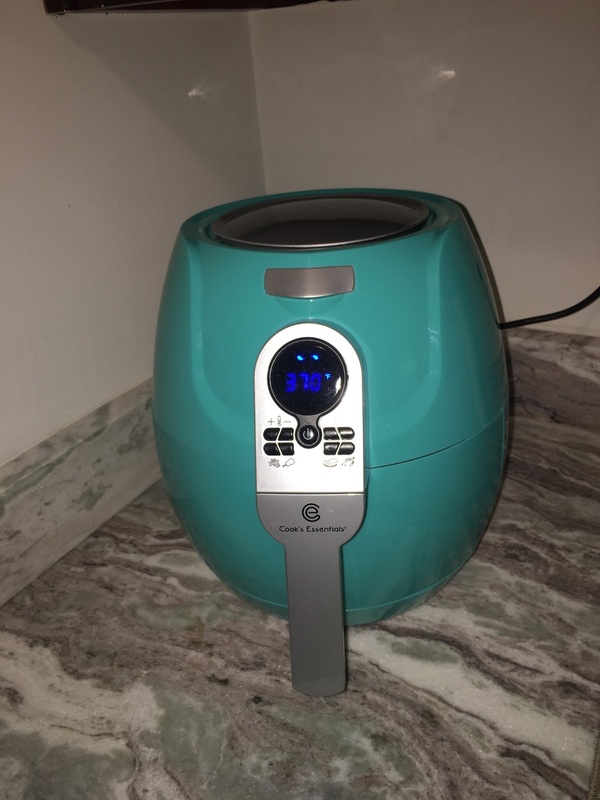 If you ever have a chance to invest in one of these, I would definitely suggest buying one.Air frying is also great for steaming vegetables among other things. Right now they have the 3 quart for $99.98 & the 5.3 quart for $95.52. The great thing about QVC is that you can do payments on it which they call easy pay. Peace & blessings, all! Have a great hump day! I love would love to hear what you would cook in an air fryer if you have/had one.